Bike share in Seattle, too pricey to push forward, is dead, Seattle Mayor Ed Murray said Friday. The millions of dollars set aside for a new system will be reallocated. Seattle’s city-run bike-share program is dead. The mayor — who is running for re-election this year — seemed to leave the door open to the possibility of the city hosting a private or partly private system. He said he remains “optimistic about the future of bike share in Seattle.” But the city is moving its money in another direction. City Councilmember Tim Burgess, a critic of Pronto and the now-scuttled plan to replace it with a different model, hailed Friday’s news. “Our experience with the Pronto … program has been a disaster,” Burgess said. “I don’t think Seattle is ready yet to invest millions of dollars” in a new system. Tom Fucoloro, the editor of Seattle Bike Blog, expressed disappointment that the city hasn’t been able to get bike share right. Portland and Vancouver, B.C., which started systems more recently, are pedaling forward, he noted. There were high hopes when Pronto launched in October 2014. Murray was supportive, having hired a bike-share expert as his transportation-department director. The system, under nonprofit ownership, had a sponsorship deal with Alaska Airlines. The idea was for Pronto to start small, with 500 bikes and 50 stations mostly downtown, then to grow over time. But it wasn’t long before bumps appeared in the road. Months after the launch, transportation director Scott Kubly began pushing for a city takeover of Pronto. But the City Council didn’t approve the change until March 2016 when it bought the system for $1.4 million. Meanwhile, the system’s finances suffered, membership and ridership declined and the city failed to win a federal grant that would have helped pay for a Pronto expansion. Some think Seattle’s mandatory helmet law contributed to the system’s woes, while the city’s hilly terrain and rainy weather were also cited as challenges. Shortly after the City Council agreed to buy Pronto, Seattle’s ethics commission opened an investigation into Kubly and the system. Because the transportation director had been president of the company contracted to operate Pronto, he was supposed to have recused himself or obtained a waiver to work on matters related to it. He hadn’t. In June, he admitted to an ethics violations, agreeing to a $10,000 settlement. 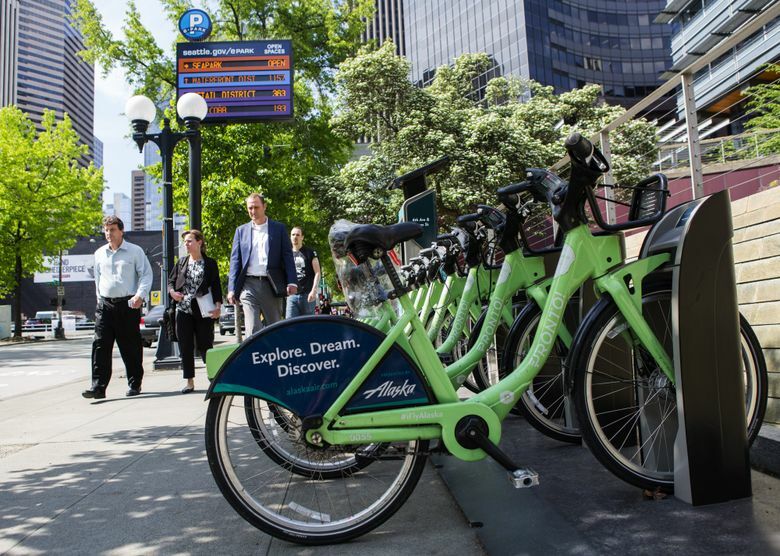 In an attempt to salvage bike share in Seattle, officials sought bids for a replacement system. They selected a winning bidder in September, choosing Bewegen’s proposal. As recently as November, while officials negotiated a deal with the company, they were showing off Bewegen’s electric bikes and touting a plan for a 100-station system. But there were warning signs. The City Council reduced the money for a bike system in Murray’s proposed 2017 budget and set a March 31 deadline for Pronto to close. And with the mayor’s announcement Friday, Seattle’s bike-share experiment appears to be finished. “This was absolutely the right call,” said Councilmember Lisa Herbold, who along with Burgess opposed the city’s purchase of Pronto. In a news release issued late Friday, the start of a three-day holiday weekend, Murray said more than $3 million previously slated for bike share will be used for bike and pedestrian infrastructure, such as Safe Routes to School projects. “This shift in funding priorities allows us to make critical bicycle and pedestrian improvements, especially for students walking and biking to school,” he said. The projects in line for money in 2017 include traffic and crosswalk improvements at 19 schools, a missing link of the Fourth Avenue bike lane and curb ramps in Pioneer Square. Representatives for Cascade Bicycle Club and Seattle Neighborhood Greenways applauded those plans, and Fucoloro said cyclists need not despair. “It’s not like the end of biking or anything,” he said.